Its colour scheme might get repainted by the seasons but we tend to view Britain’s natural landscape as a constant, not changing much from one Ice Age to the next. The reality of course is subtly different as adverse weather, seismic activity and human intervention – quarrying, mining, forestry and the like – all act to locally reshape the topography over time. As custodian of lofty structures relying on ground support and others offering clearances only measured in inches, the railway can certainly find its operations unsettled when the earth moves. Holme Tunnel accommodates the Copy Pit route (FHR6) which climbs to a summit of 749 feet between Hall Royd Junction – just east of Todmorden on the Caldervale line – and Gannow Junction near Burnley where the Colne branch converges. On the face of it, the tunnel is comparatively workaday, measuring just 265 yards. But the care it has demanded over 164 operational years has been disproportionate to that length, providing an insight into the incremental effects of external forces. How’s that for positive spin? This winter sees engineers and machinery ascend the Pennines again to lavish yet more attention on it. Opened by the Lancashire & Yorkshire Railway in November 1849, Holme Tunnel penetrates a spur of land below Thieveley Scout, an escarpment on the south-west side of the Cliviger Valley where several rotational landslips have occurred – both recent and historic – resulting in unstable, undulating terrain. Debris from one such slip comprises the upper layer of the spur which reaches a height of 35m above the tunnel’s centre. As might be expected over the course of its life, sections of the original 600mm masonry lining have demanded repair and recasing in brick. This work has been predominantly focussed towards its ends. Whilst minor defects were apparent in the 1950s, the condition of both the portals and lining was not causing any particular concern until the mid-1970s when cracking in the voussoirs at the north (Burnley) portal was observed for the first time. Although the tunnel itself was wet, with perished mortar and spalled masonry, no bulging or hollow sections had been identified at that stage. But the decade that followed brought a marked deterioration: bulges developed in several places, as well as fractures, deep open joints and considerable displacement of the north portal’s parapet. By the mid-1980s, problems at the other end had become sufficiently serious for British Rail to undertake major temporary works to improve the tunnel’s integrity. In 1986/7 and then again in 1991, a total of 152 steel ribs were inserted, supported from cess casings tied together by invert struts; associated slewing of the Up line took place to maintain clearances. This strengthening extends 81 metres into the tunnel from the Todmorden portal. But the degradation and cracking has continued to an extent that even this steelwork now shows signs of distress. Not surprisingly, then, an intensive tunnel management regime has been established, involving monthly inspections and remote monitoring of the defects and profile. Today the Up-side haunch is displaced by 320mm at the point where distortion is at its most severe, forcing the crown upwards by 180mm and driving the development of a hinge in the Down-side haunch. Loss of gauge clearance has led to the introduction of a 20mph permanent speed restriction, with obvious implications for the 80 or so passenger trains that pass over the route daily. The landslip debris overlies solid material through which most of the tunnel was bored – the Lower Coal Measures deposited during the Westphalian age. Mines feature heavily throughout the area but the Cliviger Valley Fault – with its 390-metre down throw – geologically separates the tunnel from the workings of two former pits on its west side. Coal seams do however intersect with the tunnel at five locations. The closest recorded workings – running parallel to it – occurred 35 metres to its south, close to the Todmorden end, when the Royd Wood Drift Mine was active between 1984 and 1986. It’s thought unlikely that this could have directly contributed to the tunnel’s difficulties although the colliery’s owner previously suggested that cracks did appear in the lining just a few days after one of the regular ‘pressure shifts’ in the mine which were accompanied by the floor uplifting. Whatever their cause, it’s clear that slippage and rotational failures along subgrade seams have driven the distortion, with lateral forces acting on the lining towards the south end whilst slope failures have triggered longitudinal masonry fractures near the Burnley portal. That progressive decline has made inevitable the need for another intervention, enabling works for which have been ongoing since May. This project will be more invasive than those undertaken previously but promises greater rewards, delivering W8 gauge with standard clearances and restoration of the 45mph linespeed, with passive provision for 75mph. To facilitate the work, a blockade has been agreed from 9th November to the end of March 2014 between Hall Royd Junction and Burnley Manchester Road. During that period, TransPennine and Northern Rail passengers will enjoy the scenery over Copy Pit from the comfort of replacement buses. Fulfilling the project on Network Rail’s behalf is AMCO Rail, working to a design developed by Donaldson Associates. This has three key elements: general repairs to the lining at the north end, reconstruction of the lining at the south end and rebuilding of the Todmorden portal. Allied to this will be replacement and realignment of the p-way through the tunnel and 200m either side of it to meet gauge clearance requirements, together with new six-foot drainage. 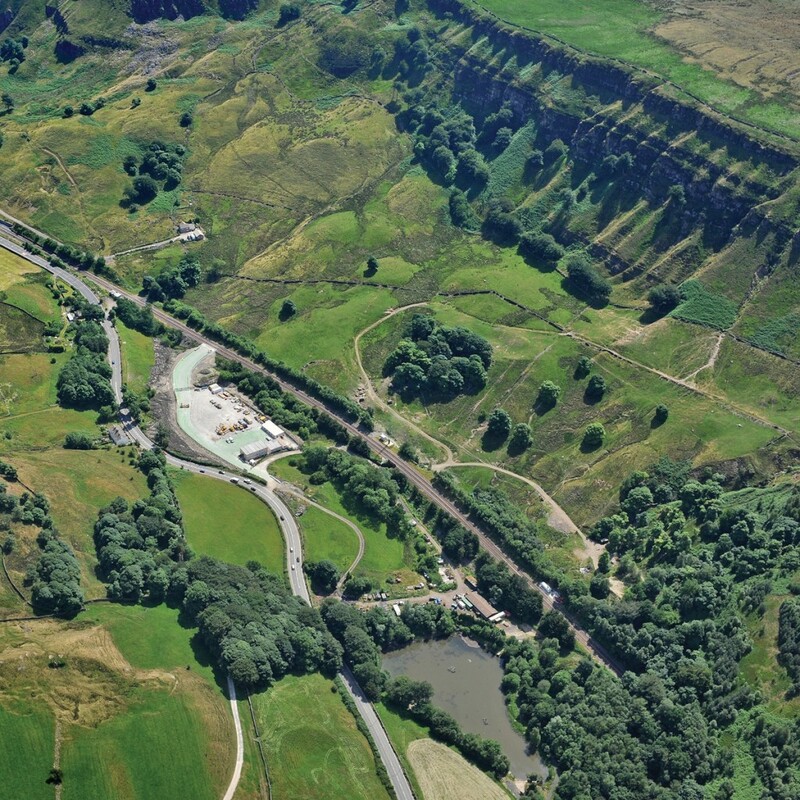 The tunnel works are costed at £16.3 million, with a further £600k being invested in around 40 smaller schemes to make best use of the opportunity brought by the closure. The spectacular Lydgate Viaduct will be among the beneficiaries. Permeation grouting has already been injected to improve the strength and cohesion of granular material behind the lining. Within the blockade, the proposed methodology will then see the masonry progressively replaced with steel arches encased in sprayed concrete from a point 88 metres from the south end, working back towards the portal. The plan goes like this. Four of the existing ribs will be withdrawn, allowing the associated cess casings to be broken out and the invert strut removed. These are located at 2.1m centres. A 1.5m length of lining will then be cut away and the estimated 32 tonnes of arisings taken by dumpers to a stockpile at the portal. Rockfall protection mesh will be fitted after the ground has been trimmed to the correct profile. A two-piece precast concrete invert will be laid on a 50mm sand bed prior to angled cess units for the new steel arches being bolted to it. The arches themselves – to be placed at 1m centres – each weigh about 4 tonnes and are being fabricated by Barnshaws. They come in three sections connected by flexible joints for ease of transport and fitment, and are to be lifted into place using a bespoke attachment mounted on a 32-tonne excavator, after which the bolts will be tightened and temporary lateral restraints employed. The estimated cycle time for removal of the existing lining and installation of one arch is 13 hours, with an additional four hours needed to cut out each group of four ribs. This sequence will be repeated until a 12-metre section is complete. Rapid-hardening concrete will then be poured to fill the invert and cess areas, after which spraying of the new 420mm thick fibre- reinforced concrete lining will get underway. Then they start again. Whilst the remaining 150 metres of tunnel towards Burnley is subject to some longitudinal movement, the deformation has significantly less structural impact. Consequently the work here will be less intrusive, comprising general maintenance and remedial treatment: cross-pinning of the masonry, crack stitching, repointing and so forth. In an effort to reduce the water ingress, which becomes more prevalent towards the portal, hollow sections will be grouted and low-level weep holes cut. There’ll be some spot brick replacement as well as recasing of several spalled brickwork areas, amounting to 77m2. It’s routine, low-tech, high-volume activity but comes with its own set of practical challenges. The Todmorden portal is typical of its time, designed by John Hawkshaw, the Lancashire & Yorkshire’s preeminent Consulting Engineer. Lacking the flourishes that adorn many others, the portal does have a unique character thanks to the reshaping forced upon it by the ground movement. As the crown of the arch has been pushed upwards, so too has the parapet’s middle. Fortunately for the project team, the listings folk at English Heritage have not been troubled by Holme Tunnel; this has afforded scope for a design solution in concrete. Rock bolts have been inserted through the portal’s spandrels and wing walls in preparation for the blockade. Thereafter the parapet will be dismantled and dowel bars fixed into the wing walls to support new in-situ concrete spandrels and parapet beam. The voussoirs will then be removed to allow completion of the lining, after which the portal’s foundations will be installed and its concrete face finished. Although arrogance might delude us into believing otherwise, it’s a reflection of man’s position in the overall hierarchy that our attempts to remodel the world around us can only ever be regarded as temporary, vulnerable to irresistible forces far beyond those we could ever hope to exert. For evidence of that, you need only look in some disused tunnels to see how rapid their decline can be when maintenance ends and nature is left to do her worst. But the 21st century has brought advantages that were not around 25 years ago when Holme Tunnel’s troubles were last substantively tackled. As such, this winter’s project will bring a solution for the longer term: reinstating the tunnel’s structural integrity and allowing the return of a normal asset management regime. Performance will improve and line closure risks diminish as the structure’s deterioration is halted. We’ll return to chart the trials and tribulations posed by those objectives next year. Next articleNever bet on a blockade!